He was born on April 30, 1933 in Silver Lake, KS the son of Ollie Bailey, Sr. and Ellen (Day) Bailey. He grew up with his large family. Ollie met Mildred “Millie” Champney in 1951, and the two were married on April 18, 1953. She preceded him in death on February 21, 2017. 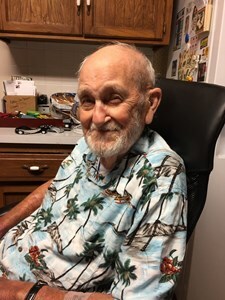 He graduated from Silver Lake High School in 1951 and served in the United States Army from 12/14/1953 through 12/14/1955. Millie had their first son, Richard “Rick” Bailey on November 7, 1954. She gave birth to their second son, David “Brad” Bailey on February 7, 1956. The family lived in El Paso, TX, and in South Carolina during Ollie’s service with the United States Army. Ollie worked for over 30 years with Santa Fe before retiring in 1988. After retiring he started mowing lawns for residents and businesses for many years. Ollie was active in kids baseball as a coach, and active in the East Topeka community raising money for the booster club, which turned into a 50 year love of selling fireworks. Ollie would always build his fireworks stand, which became a great gathering of friends and family having fun selling and shooting off fireworks. One of his greatest joys was hearing people coming back to reminisce about the fun of fireworks. He enjoyed watching his grandchildren do anything, and would go anywhere to do it. Jr. loved spending time with his loving wife, Millie. When KU played baseball against Nebraska in Lincoln, the crowd was filled with Cornhuskers in Red, with the exception of a couple of Jayhawks right in the middle: Millie and Junior. They also enjoyed gambling together all over the country. Just about anywhere Millie and Jr. went together; they were always able to find a place to gamble. Ollie had a great way of celebrating with a little dance at the slot machine or the crap table. Ollie will be remembered for the loving care and attention that he gave to Millie through the years, she was his greatest treasure. He was preceded in death by his parents; wife, Millie Bailey, siblings, Iva Thompson (Ernie), Lula Chiddix (John), Delphia Myers (Rafe), Velta Chase (Frank), Woodrow Bailey (Ora Lou), Glen Bailey (Dorothy), and Raymond Bailey (Marie). Memorial contributions may be made to the Topeka Alzheimer’s Association, 3625 SW 29th St. Suite 102 Topeka, KS 66614. Add your memories to the guest book of Ollie Bailey, Jr..
Rick, Brad and family, I'm so sorry for your loss. Your mom and dad were great neighbors to my mom and dad. I will always remember the years of going to the fireworks stand. It was always fun when you all shot off the leftovers! Lots of childhood memories. Hugs and prayers for you all. So sorry to hear about this great loss. I remember the fireworks stands, shooting off fireworks at the Bailey farm with some of the leftover ones, the dinners at Grandma Bailey's, and helping my Dad (Raymond Bailey) build Uncle Juniors house. We have so many memories from such a great man. He will truly be missed. What a special man. We’ll miss him and that smile. We are so sorry for your loss.